The Giant Rafflesia, the biggest flower in the world, is a rare sight that can be spotted in just a few countries in Southeast Asia: Thailand, Borneo, Indonesia, Malaysia and the Philippines. If you are in Thailand, head to Khao Sok National Park and ask at the local tourist agencies if the flower has been seen blooming recently. 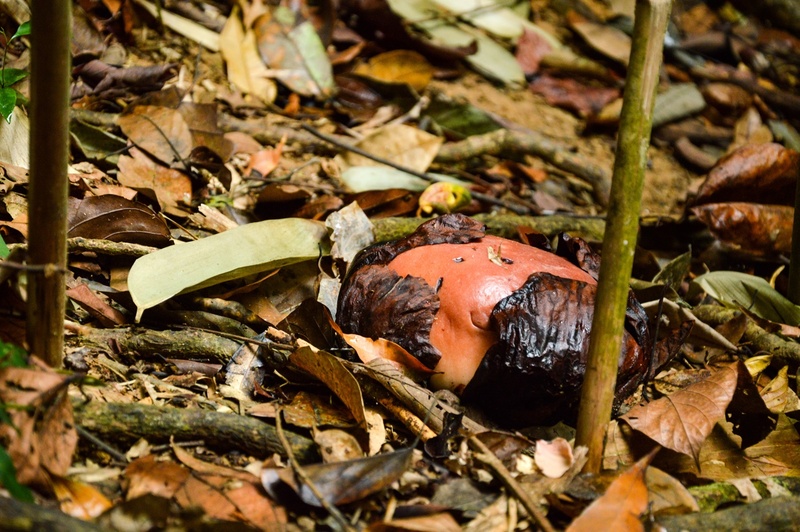 Here’s more information about the Rafflesia and how to find it in the wild in Thailand. 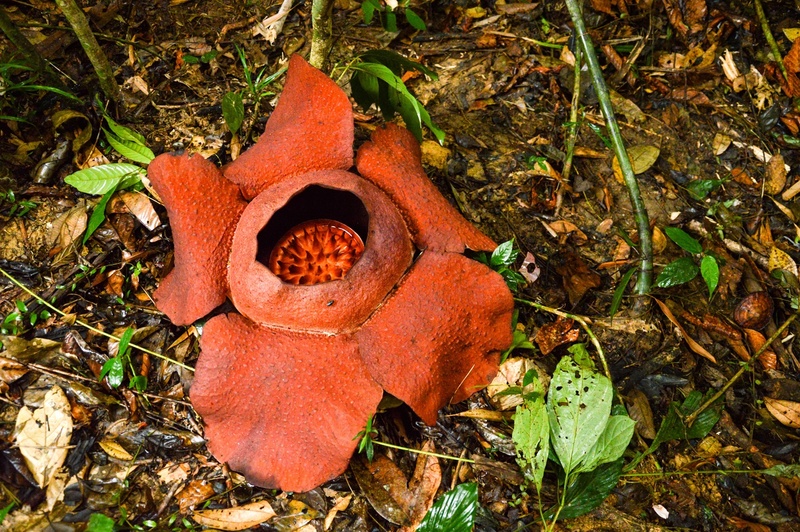 Why is the Giant Rafflesia so special? 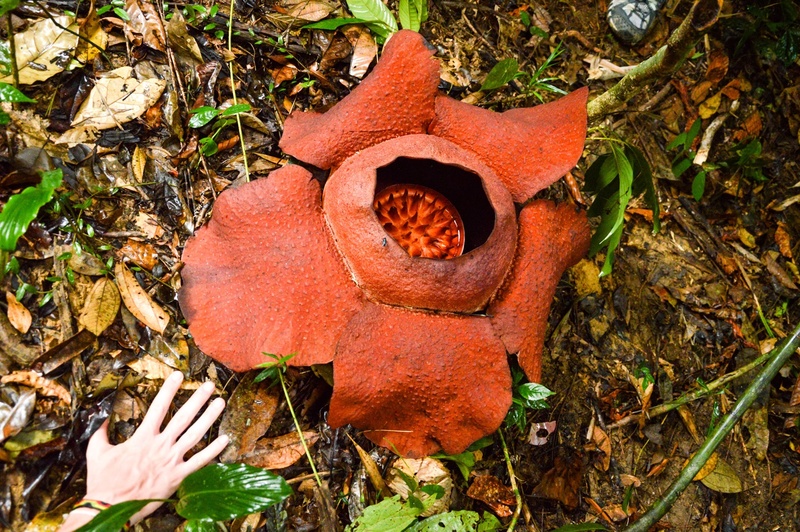 The Giant Rafflesia, which weighs up to 7 kg, boasts the biggest bloom in the world (the world record is 107 cm in diameter, and the average is around 1 m). What makes the flower even more special is that it takes 8-9 months to grow from bud to bloom, and the dark red petals are alive for a few days to a week only. Afterwards they decay to a black mass and you have to wait another year to see the magical spectacle. The Rafflesia is a parasite with no stem, leaves or roots, growing instead on a tropical vine. When does the Rafflesia bloom? Nobody knows when the flower will bloom, as the season changes from year to year depending on conditions. It’s a good idea to contact a local agency a few days prior to arriving – they can tell you if it’s the right time to see the Rafflesia. December and January seem to be the most likely months, but the bloom could happen any time. 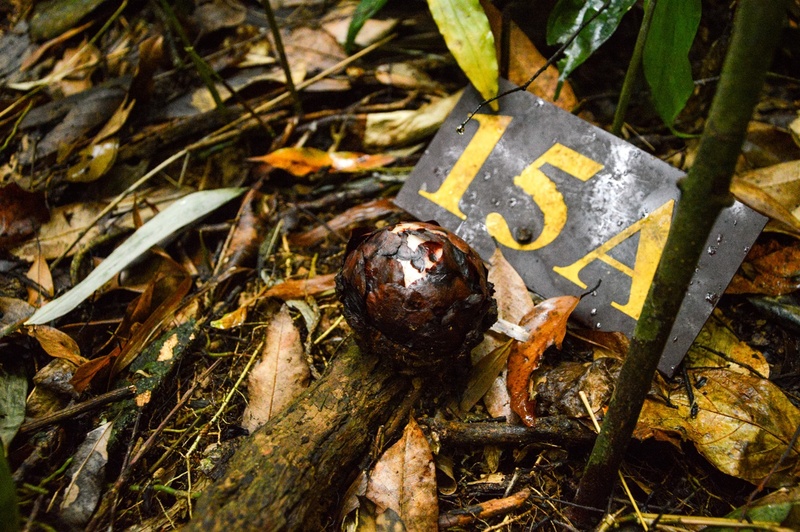 Can you reach the Rafflesia in Khao Sok National Park without a guide? The trails leading to the Rafflesia are in a way well marked, but the starting points are small, innocuous-looking paths by the roadside, which are kind of hidden on purpose. If you don’t know the starting point, you can’t get any farther. At first, I was kind of annoyed that you must hire a guide (500-1500 baht for two hours depending on the agency and how big the group is) instead of getting there yourself. I initially thought they arranged it like this as a way of making money from foreigners, but I was proven wrong. The park rangers from Khao Sok take good care of the rare flowers – every bud is numbered and monitored through the year, and your guide makes sure you behave responsibly around the flower. You are not allowed to touch or, god forbid, pick the Rafflesia. If everyone could find the flowers on their own, the beautiful Rafflesia would undoubtedly suffer more damage. 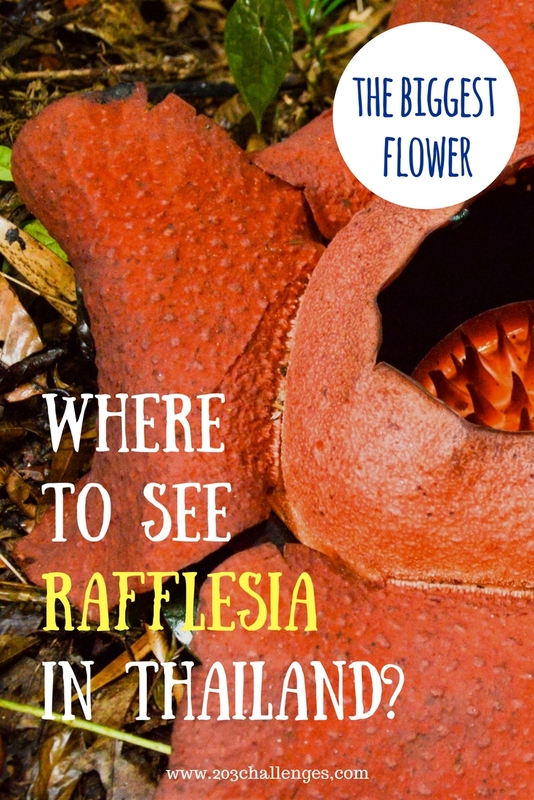 How does the Rafflesia smell? 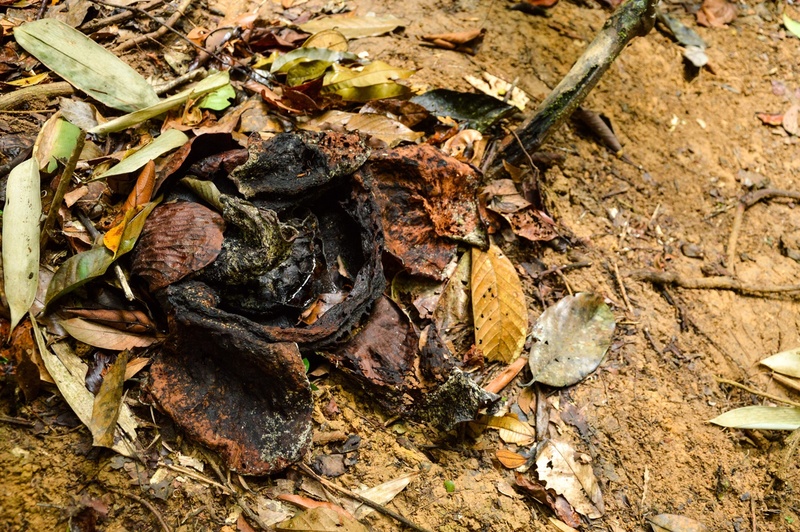 Before I visited the Rafflesia, I had read on the internet about how dreadful, life-endangering and dead-corpse-like the stench of the rotten flower was. Eager to try this lethal weapon on my own nose, I almost screamed out of excitement when I saw a dead Rafflesia on the way. But what a disappointment! There was nothing! I couldn’t understand why, as our guide spoke only Japanese (which I don’t speak), but after reading many blogs on the topic, I think I might be the first person in the world who has been spared the rotten-meat smell of this incredible plant.